Children’s Books We Love! : Chinese New Year | OFF KLTR! Here are some of OFF KiLTeR’s favorite children’s books about the holiday. Bringing in the New Year by Grace Lin. Knopf Books 2008. A Chinese-American family prepares for the Lunar New Year. There is very little text, but beautiful pictures by the talented Grace Lin. There is also a great explanation of holiday at the end of the book. D is for Dragon Dance by Ying Chang Compestine. Holiday House, 2006. 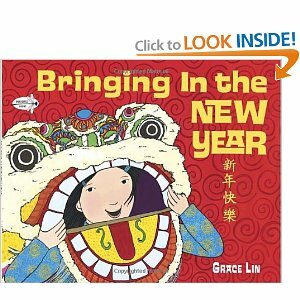 The book is organized by the alphabet and follows a boy and a girl preparing for Chinese New Year festivities with their family. Each page represents one letter of the alphabet. Dragon Dance: a Chinese New Year lift-the-flap book by Joan Holub. Puffin, 2003. This book is a favorite at our house. Cute, quick cultural book for young readers. Lanterns and Firecrackers: a Chinese New Year Story (Festival Time!) by Jonny Zucker. Barrons, 2003. Cute story with very little text would be most suitable for the YOUNGEST children. This very simple introduction to the Chinese New Year focuses on food, families, and customs. Great for preschool class reads.